The Sanchi Stupa is a Buddhist temple built by Emperor Ashoka of the Maurya dynasty. It is located 46 kilometers from Bhopal. This structure is one of the oldest stone structures in India. The temple was built by emperor Ashoka who installed Buddhism relics and built a chatra to protect and honor the relics. The temple has four different gateways each facing different directions. All these gateways were designed with incarnate sculptures which depict various legends and events. The Sanchi Stupa was laid in total abandon until it was rediscovered by General Henry Taylor, a British officer in 1818. Between 1912 and 1919 proper restoration of the structure was done under Sir John Marshall who was the Head of the Archeological Survey of India. 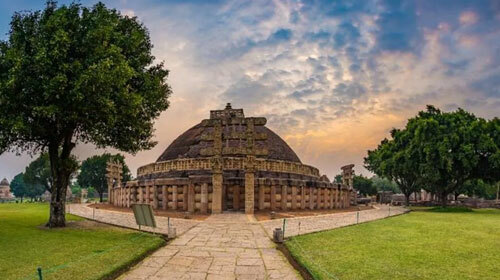 The best time to visit Sanchi Stupa is during the months of November to March. During the last Sunday of November, when the relics are in full display, devotees flock to this temple to offer their worship.